How Should We Manage Small Prairies? Prairie management can be complicated, regardless of how big a prairie is. Managing small prairies, however, is especially challenging, and it can be difficult to know how to set appropriate objectives – let alone how to achieve them. Living in east-central Nebraska, I’m in the transition zone between the small fragmented grasslands of the tallgrass prairie to the east and large expansive prairies to the west of me. Because of that, I have done a lot of thinking about what objectives and strategies might apply to small prairies, large prairies, or both. I certainly don’t have all the answers, but I thought I’d lay out some thoughts and get some input from those of you reading this blog. There are some prairie species that simply can’t survive in small prairies. The prairie size limitations of birds, for example, have been well studied. Very few bird species will attempt to nest in a five or ten acre prairie, and the few that do will likely face high predation rates. Red-winged blackbirds and dickcissels are examples of birds that often will nest in small prairies, while upland sandpipers, bobolinks, and Henslow’s sparrows typically choose much larger prairies – perhaps 100 acres or bigger. Greater prairie chickens need large prairies too, but chickens also need the surrounding landscape to help provide the full suite of their habitat requirements (courtship display sites, nesting areas, brood-rearing habitat, and winter cover). 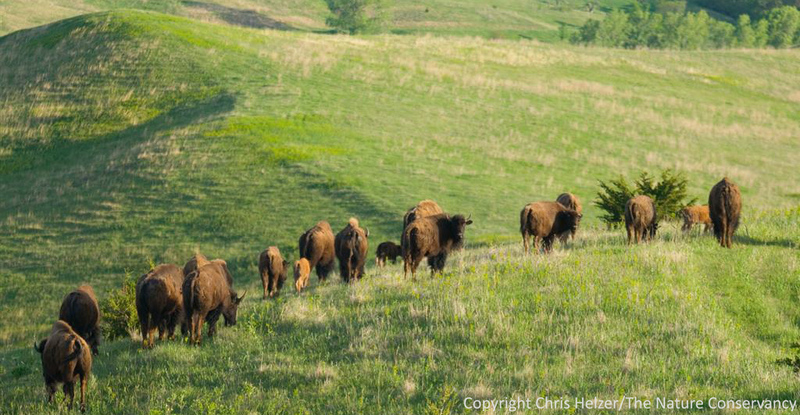 The bison is another example of a prairie species not often found in small prairies. Since bison are also livestock (outside of a few very large public refuges in the west) their need for large prairies is due to a combination of the life history requirements and the logistics of handling and caring for them. The necessity of strong fences, watering facilities, robust catch pens and corrals for annual inoculations, and other infrastructure associated with appropriately handling bison as livestock makes the species expensive to own and manage – especially on small sites. More importantly, bison are just made for large spaces. Their social structures, feeding behavior, seasonal movement patterns, and other characteristics are best suited for very large grassland areas. Because of all these factors, the bison managers I know and respect typically recommend prairie sizes of several thousand acres as a bare minimum for the species. Bison fit best in prairies that are thousands of acres in size. Small prairies mean small population sizes for the species living in them. You can only fit so many individuals of a species into a tiny area of habitat. This creates problems because small populations are much more vulnerable to local extinction (disappearing from a particular place) than larger populations. For example, a deadly pathogen such as a fungal or bacterial infection that might affect only a small portion of a species’ population in a large grassland could easily wipe out the entire population of that species in a smaller prairie. Similarly, it’s rare that a single fire consumes all of the vegetation in a large prairie, so unburned refuges are left for insects and other animals that are particularly prone to being killed by fire. However, a prescribed fire or wildfire that burns an entire small prairie could easily kill every single individual of a sensitive insect species. This kind of vulnerability means that populations of rare or sensitive species are really just hanging on by their fingertips in many small prairies, and a single event could completely eliminate them. Often, small prairies are geographically separated from other prairies. That kind of isolation means that if one of the events mentioned above happens to knock a species out of a small prairie, there is little to no chance of the species recolonizing from another similar site. In addition, a small population in an isolated prairie is not interacting genetically with other populations, and that can lead to degradation of the genetic health of a species. Poor genetic health increases a species’ vulnerability to diseases and reduces its ability to adapt to changing conditions. The conditions that create isolation differ by species. Birds, for example, are much more able to move from one prairie to another – even across relatively great distances – than a walking stick insect. Because of that, two prairies could both be easily accessible to a bird, but to a stick insect those prairies might as well be on different planets. 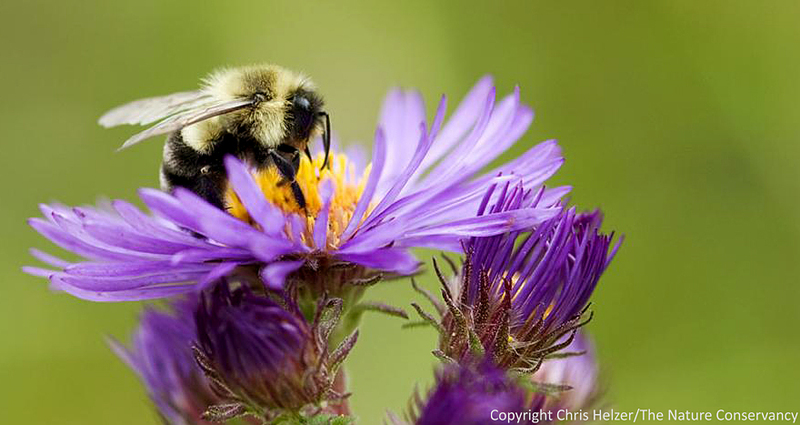 In addition, the land cover between prairies affects species differently. 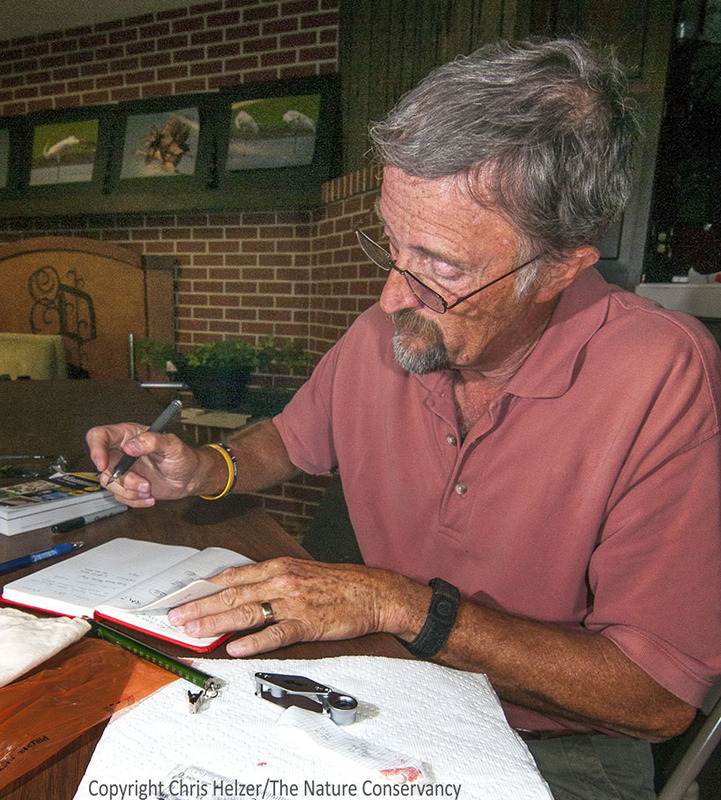 A mouse might not have any trouble moving across a gravel road, but Ron Panzer’s research near Chicago (and that of others) has shown that some leafhoppers and other insect species see those kinds of roads as impenetrable barriers. In addition to biological issues, small prairies can also present many logistical challenges to managers. For example, grazing is usually not feasible at small sites because the cost of necessary infrastructure is prohibitive. Small prairies can also be difficult to break into multiple management units so that one portion can be hayed or burned while another is idled. In some cases, small prairies that are near urban or suburban areas – or other areas sensitive to smoke – can’t be managed with prescribed fire because of local regulations or because it’s not possible to prevent smoke impacts to neighboring areas. All of these factors reduce the number of options available to a prairie manager already struggling with the biological challenges listed above. 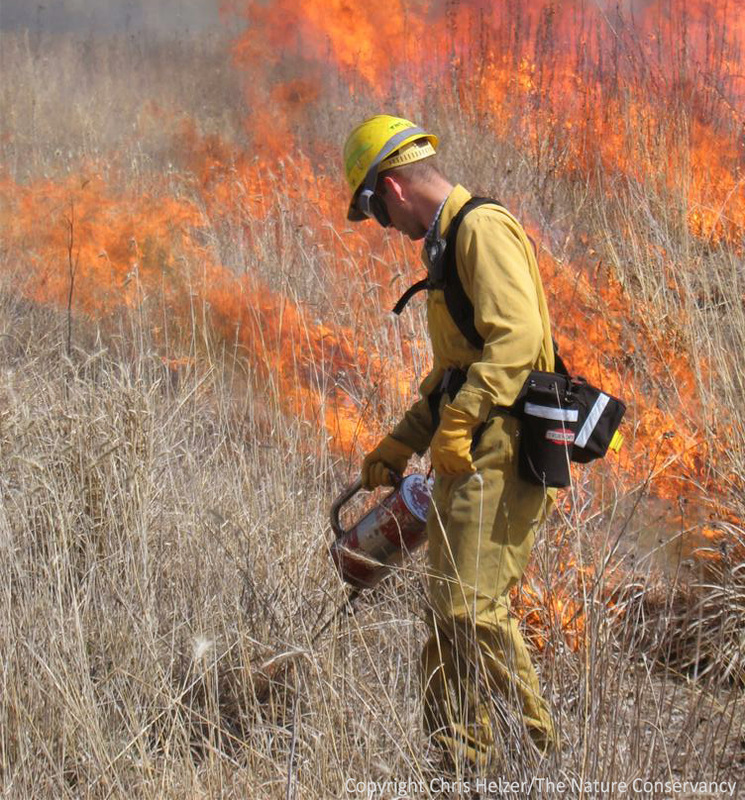 Prescribed fire is an important tool for prairie management, but can be difficult to use in some small prairies. As a final insult, small prairies are also much more vulnerable to outside threats such as invasive plant species, as well as domestic cats and other predators. In a large prairie, Siberian elms invading from a nearby woodlot might affect one corner of the prairie, giving a manager time to recognize the threat and suppress it before it spreads across the entire site. Smaller prairies can often be completely overrun by an invasive species before the manager even recognizes its existence. 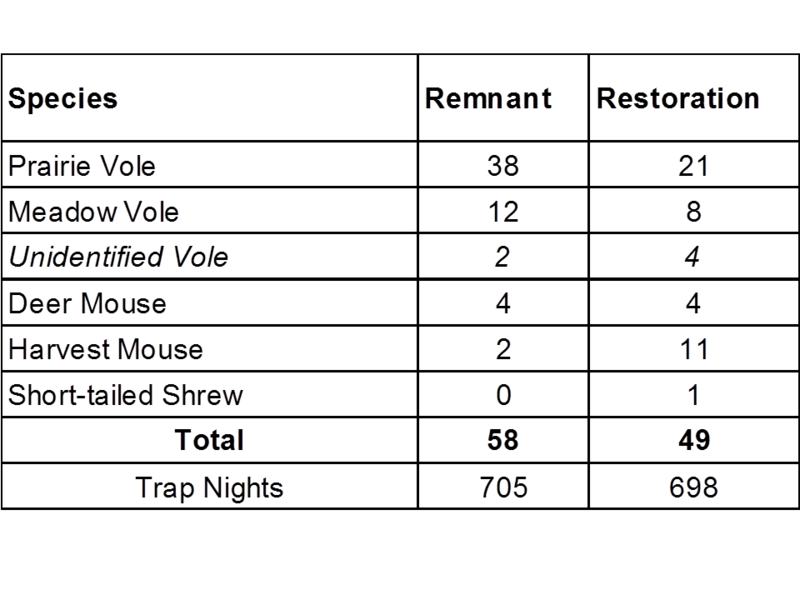 In addition, raccoons, cats, and other predators can range easily across a small prairie and greatly reduce the possibility of survival for many bird, mammal, or reptile species. Large prairies contain interior areas that are far enough away from wooded edges and neighboring farmsteads to escape those “edge habitat” predators. Unfortunately, our state of knowledge about small prairies, habitat fragmentation and isolation, and the ways in which those conditions affect prairie species is pretty limited. 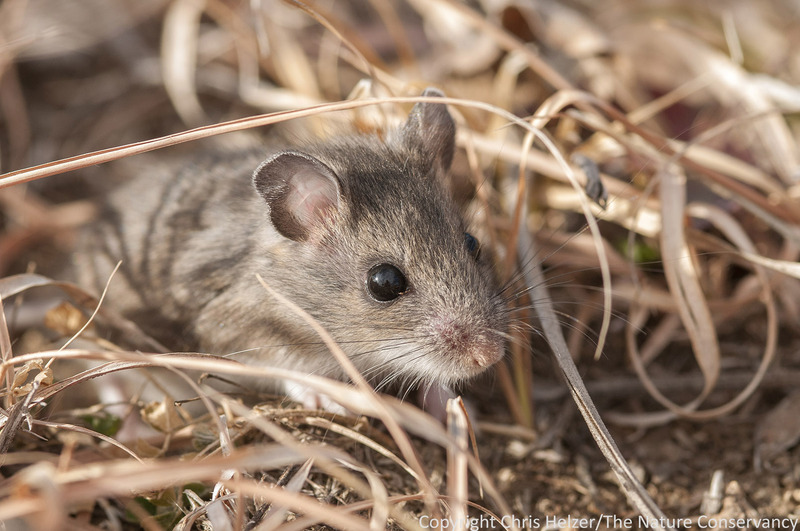 Which species are most vulnerable to small prairie size? What counts as a prairie to various species? Is a Conservation Reserve Program (CRP) grassland planting with warm-season grasses and a few wildflower species sufficient to maintain bird populations? What about bees or other species? Can those low-diversity habitats facilitate travel between otherwise isolated prairies? If so, for what species? How well do prairie habitats along road ditches act as corridors between prairies? What kind of plant diversity and/or landscape configuration is necessary to support populations of bees? In many ways, we’re flying blind. It’s easy to say “the bigger the better” but that doesn’t do much to help managers who are trying to conserve what they can in prairies that are small and likely to stay that way. There is research underway – including some that I’m involved with – that will help us better understand the impacts of habitat fragmentation and small prairie size on grassland communities, but we’re a long way from understanding some very important fundamentals. Fortunately, though the prognosis for small prairies can appear bleak, there is also much reason to hope. There are numerous examples of very small prairies that have maintained populations of hundreds of plant and insect species through more than a century of isolation from other prairie habitats. Yes, there are some rare butterfly species and other insects that are often missing from tiny grasslands, but most other species have managed to hang on. In addition, while it’s no longer possible to support wide-ranging species such as prairie chickens or bison in small prairies, the absence of those species doesn’t impact the chances of survival for the vast majority of others. Sure, it’d be nice to have those large charismatic species, but missing them is more of an emotional issue than a functional one. Life in small prairies is not getting any easier, and many of the species that have survived to date are likely to face increasingly greater challenges. In addition to the plight of individual species, ecological processes such as pollination and seed dispersal that help hold prairie communities together are much more fragile in small sites. However, I think we can take great hope from the resilience that prairies have shown so far, and use that hope to fuel us as we forge ahead. It would be hard to fault the prairie manager for deciding that the rare butterfly should be the top priority for management objectives. On the other hand, a strong argument could be made that the long term survival of that butterfly is unlikely, regardless of the manager’s best efforts. A single wildfire, a late freeze or cool/wet spring, a disease outbreak, or innumerable other events could spell the end of that tiny vulnerable population. Is it worth putting other species at risk or decreasing the overall ecological resilience of the prairie in the faint hope of preserving one species for a while longer? Maybe. I don’t think there’s a right or wrong answer – just tough choices. If the rare butterfly was a rare plant species instead, the choices would still be difficult. Should the manager attempt to maximize the survival of the individual plants within that species even if that management decreased the survival chances for other prairie species? If a more balanced approach was desired, would it be ok to implement a management regime that prevented those rare plants from blooming in some years, or even decreased the population size? If that management strengthened the surrounding prairie community, making it more resistant to invasive species or supportive of a stronger pollinator community, would that offset the decrease in population size for the rare plant? Maybe. Again – tough choices. What if a prairie manager decided that the best and highest use of a 10 acre isolated prairie was for education? Would it be ethically wrong for that manager to burn the entire prairie each spring to maximize showy wildflowers as a way to draw people to the prairie? If that wildflower display led the prairie to be used by classroom teachers, and hundreds of kids a year had a chance to explore the prairie, would that be worth the potential sacrifice of a rare butterfly species and/or a rare plant species at that particular site? If that application of fire eventually led to the loss of other plant and animal species not favored by annual burning, would the ensuing loss of ecological resilience and the potential risks associated with that be worth the educational value gained? Maybe. That’s a lot of school kids. Capturing the attention of the public might be the highest and best use of some small prairies - even if that comes at the expense of other conservation values such as plant diversity or rare insects. In some ways, the management choice comes down to a choice between narrow and broad. Should the manager restrict management in ways that favor a particular species or a particular “look” or should the manager attempt to manage for a broad suite of species at the potential expense of a few rare ones? If the former choice is made, there are certainly risks associated (see my earlier post on Calendar Prairies). However, if the latter choice is made, the risks may be equally high. In my opinion, the broad option – managing a prairie for biological diversity and ecological resilience -means that each portion of the prairie needs to be exposed to a shifting mosaic of disturbances over time. Theoretically this kind of management gives every species in the prairie an opportunity to thrive. In our example of the 10 acre isolated prairie, this might mean that several different management activities occur each year. For example, in one year, a third of the site might be hayed in the summer, a third might be burned in the early spring, and a third might be left idle. In the next year, ½ of the site might be burned in the late spring and the other half might be idled – and so on. Over time, a plant growing in any particular location should get the periodic opportunity to bloom and reproduce in conditions that favor it. Relatively mobile animal species should be able to locate suitable habitat in most or all years. Less mobile animals might have to suffer through a tough year now and then in return for banner years in between. Of course, all of this is much easier to accomplish on larger sites than on smaller ones, and the margin of error – and the penalties for those errors – would be less of a concern if the prairie was 300 acres in size instead of ten. Is this really the best approach for small prairies? While this kind of dynamic management could help support a wide diversity of species, it might also have the opposite effect. With narrowly-focused management, selected species are continually favored over others, and those less fortunate species will probably fade from the community over time. However, with dynamic management, EVERY species has to survive periods of management that make life hard. When dealing with small populations, every hardship a species has to endure could potentially be its last. Does adversity make those species tougher, or does it slowly weaken them until they die? As a final consideration, most small prairies have long histories of fairly repetitive management (annual haying, regular burning, etc.) and it’s not always easy to predict what positive or negative impacts might result from changing that management to something more erratic. It’s possible that altering the management regime that has allowed the current suite of species to survive so far would shake things up in a way that makes the situation worse, not better. Taking into account the potential benefits and risks from broadly-focused management, is it really smart for a manager to choose the dynamic management approach? Is the risk of losing rare species or the uncertainty about the results of shaking up a long history of consistent management worth it? Again – maybe. There are no easy answers when it comes to the management of small prairies. Poor population viability, increased risks from invasive species and other threats, and inherent management complications can make a manager’s job seem almost impossible. On the other hand, it’s important to remember how many species have survived thus far – largely on their own. 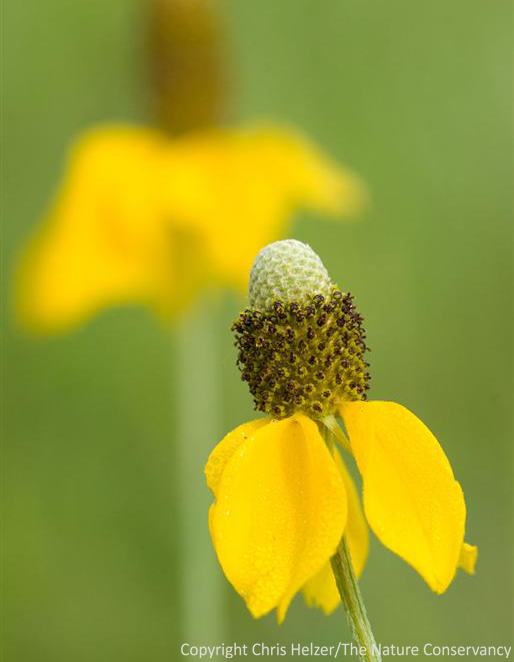 Prairie coneflower (Ratibida columnifera) is a tough species that has been able to thrive in prairies that have been highly fragmented and/or otherwise degraded. Many other species have also found ways to survive too - and likely will for the foreseeable future. The biggest challenge for a manager is to identify appropriate objectives. It can be easy to try to make a small prairie be more than it can be. Wide-ranging species and rare species that have narrow habitat requirements can both be very difficult to maintain. While there is no right or wrong way to set objectives, choosing to manage for those species is likely to lead to frustration and failure unless the surrounding landscape is very supportive. Managing too much for a few species may also lead to the loss of other species and a degradation of the ecological web that supports the very species being targeted for management. On the other hand, particularly in the case of rare species, it may be that prolonging the survival of small populations can give larger region-wide recovery efforts needed time to be successful. Again, there are no easy answers. In most situations, I think it probably makes the most sense to manage small prairies with the objective of maintaining the highest possible number of species (and hopefully, ecological processes) – even if this might result in the loss of some of the less common or adaptable species over time. Because species diversity is strongly tied to ecological resilience, and small prairies are already more vulnerable to many threats than larger prairies, it seems logical that sustaining diversity and resilience should be paramount. When doing this, it’s important to provide dynamic and non-repetitive management treatments, but also to recognize and respond to the high risk posed by invasive species and predation coming from the borders of. Vigilantly patrolling for invasive plants and minimizing habitat that encourages predators such as raccoons and cats are examples of strategies that can help. Even if a prairie manager does everything right – whatever that means – small prairies are destined to lose species over time. Weather events, diseases, wildfires, population cycles, and other occurrences are outside a manager’s control but inevitable. It’s probably smart for managers to resign themselves to that inevitability and focus on what they can control. While it can be depressing to think about the long-term future of small prairies, there are two big rays of hope worth remembering. First, as mentioned earlier, some small prairies lend themselves very well to providing educational opportunities for the public. If those prairies can be used to raise awareness and help build a stronger constituency for prairie conservation, that’s an awfully big contribution to the world. Second, in an earlier post, I described the ways that prairie restoration (aka reconstruction) can and is being used to enlarge and reconnect small prairies. It’s expensive, and not feasible in all situations, but we have the technology and expertise to do it. That means we don’t have to just sit and watch the long-term degradation of tiny remnant grasslands and the populations of species they support. Our growing ability to stitch the prairie landscape back together might be our greatest hope of all.